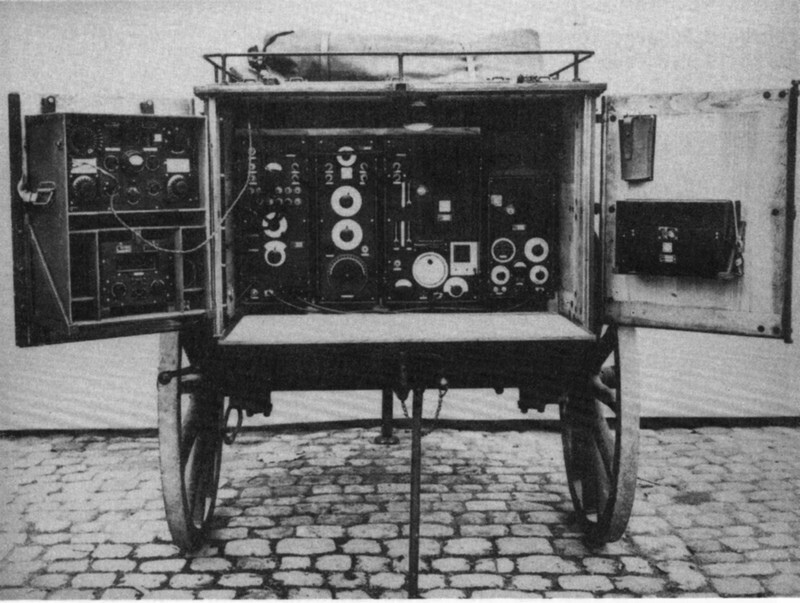 The Heavy Mobile Wireless Station (Fahrbar Schwere Funkstation) F.S.25 has been developed by Telefunken GmbH, Berlin, in the years 1923/24. It was one of the earliest mobile wireless stations for telephony operation. Four stations have been acquired by the Swiss Signal Troops in 1925/28, 1937 they were handed over to Signals Kp 5.
generator made by Siemens (100 Volts, 500 Hz, 20A and 50 Volts, 12 A)operated by a fuel powered motor. 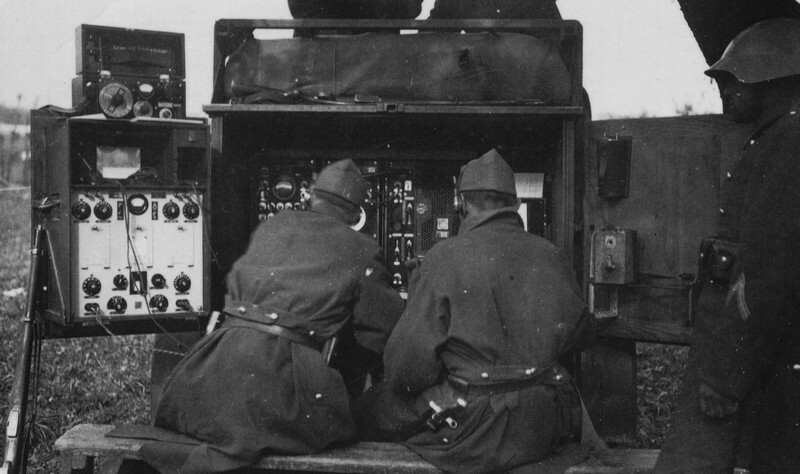 The Heavy Mobile Wireless Station (Fahrbar Schwere Funkstation) F.S.25 has been developed by Telefunken Berlin in the years 1923/24 and was introduced with the Signal Troops in 1924/25, in total, four stations had been acquired. 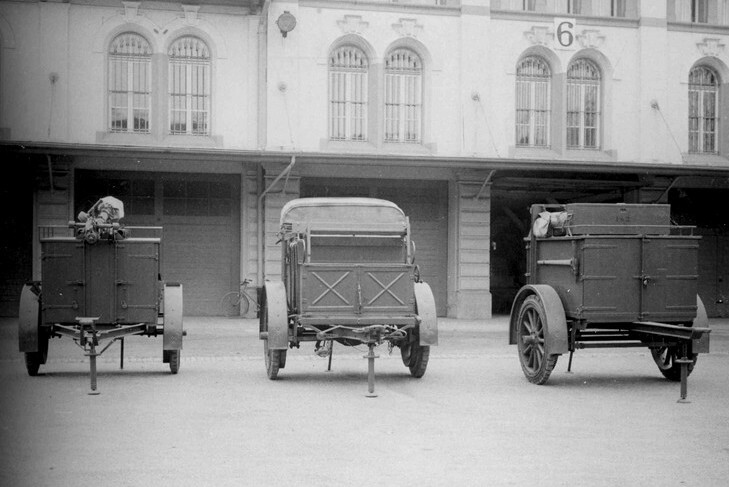 Normally, the station was mobile: a series of two or three limbers was pulled by an open truck: The "apparatus trailer" (1100 kg), the "machine trailer" (1300 kg) and the "mast trailer" (1400 kg). Evidently, it was very challenging to maneuver this train of limbers. The transmitter Telefunken Spez 219Bs can be tuned from 350 - 3025 m (99 - 857 kHz). In the transmitter, two valves RS55, two RS19 as finals and a rectifier RG64 have been used. The transmitter has an RF output of 200 Watts in telegraphy CW (A1) and 70 Watts in telephony mode (A3), the 500 Hz AC power is rectified to generate the 1000 Hz audio frequency for modulated telegraphy. In the first years, a Telefunken Spez 7 Bs Receiver (Empfänger E25) with two valves RE062t and a double stage voice amplifier Spez 60 Bs has been used as main receiver of the station, in 1933, it has been replaced by the long wave receiver Telefunken Spez 470Bs / E31, the TRF receiver with three tuned circuits covers the 100 - 1091 kHz long- / mediumwaves in four ranges. Six valves RE074 neutro are used in this receiver. The Fahrbar Schwere Funkstation F.S. / SE-301 was used with a T or L antenna with a length of 60 m on two 12m masts. The F.S. 25 has been assigned to the Signal Kp 5 in the year 1937, during WW II, the components of the station have been converted for portable use in wooden crates, this variant called the S.M. got the new designation SE-216 in 1951. The mobile variant got the designation SE-301 and was used with Landsturm Signal Kp 57 / 58 until it was definitely withdrawn in the year 1956.